Integrators looking to maximise convenience for clients while minimising service calls should be pleased by Luxul’s addition of ‘self healing’ capability to its switches in its latest firmware upgrade. Essentially, the update upgrades switches with two advanced new features, Auto-Recovery and Power Scheduling, for PoE-connected devices. ‘Power Scheduling’ empowers integrators with the ability to trigger the switches to power PoE-connected devices on or off based on any schedule they create within the switch. The major benefits of the upgrade include allowing for easier and less costly remote service provision to clients. It is hoped the improvements will reduce the need to send technicians for service calls. 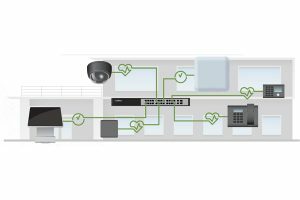 “Imagine never getting another call about security cameras or other PoE-connected devices freezing up; your clients’ switches will take care of them automatically. Furthermore, it’s effortless to schedule devices to power down overnight, over the weekend, or whenever your clients request it. All it takes to realise these benefits is a free firmware update,” Luxul vice president of marketing Mike Grubb commented. Luxul’s Self-Healing capability is currently available on the company’s 12-port/8 PoE+ AMS-1208P, 26-port/24 PoE+ stackable L2/L3 AMS-4424P, 26-port/24 PoE+ AMS-2624P, 26-port/24 PoE+ XMS-2624P, 52-port PoE+ L2/L3 XMS-5248P, and 52-port stackable L2/L3 XMS-7048. It will be a standard feature on a number of upcoming Luxul switches, including the 18-port/16 PoE+ L2/L3 AMS-1816P and 12-port/8 PoE+ XMS-1208P too.